These great comedians can teach our students about two important writing habits: working hard at revising and writing on a regular basis. Two of the best-known comedians working today could teach our students a thing or two about writing. Chris Rock has made dozens of movies and headlined multiple concert tours. 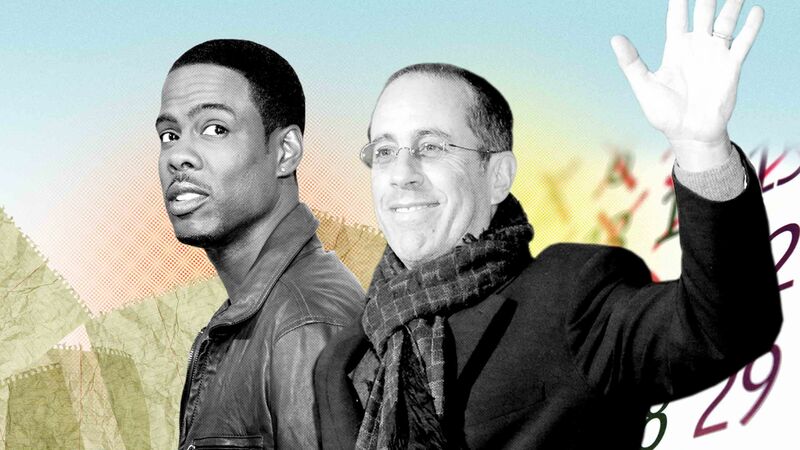 And Jerry Seinfeld, star of the ’90s smash TV show Seinfeld, is still one of the most famous comedians in the world. The ways they go about writing jokes offer powerful lessons for our students. In a book called Little Bets, author Peter Sims details how Rock writes. Before heading out on his last tour, for example, Rock made about 50 appearances at a tiny comedy club in New Jersey. Often he would show up unannounced and perform to crowds of less than 50 people. Sims describes Rock as going on stage with his new material—often just drafts or ideas for jokes—written on a yellow legal pad. Rock wasn’t there to perform his old material. He wasn’t there to tell jokes he knew would kill. He was there to write—to work on and improve his writing. Sims points out that in sets that “run around forty-five minutes, most of the jokes fall flat. His early performances can be painful to watch. Jokes will ramble, he’ll lose his train of thought and need to refer to his notes, and some audience members sit with their arms folded, noticeably unimpressed.” In short, Rock often bombs at this point in his process—his early drafts aren’t good enough to impress. And isn’t his early writing much like our students’ early writing? It’s messy, sometimes rambles, and often doesn’t flow. It’s what Rock does with his first drafts that makes him a great writer. While his jokes are bombing and falling flat, he’s constantly taking notes. He’s writing and rewriting, noting what to keep, what to throw out, what to move around. Sims details how the comedian “tries hundreds (if not thousands) of preliminary ideas, out of which only a handful will make the final cut.” While watching Rock practice early material, fellow comedian Matt Ruby once said, “More than anything, you see how much hard work it is. He’s grinding out this material.” It’s this grind—this hard work of rewriting and making improvements—that makes all the difference. So what can Rock teach students about writing? Even successful writers don’t write perfect first drafts. Many of my struggling writers have a fixed mindset that people are either good at writing or not. Sharing stories about successful comedians or popular musicians struggling to make something better offers a motivational boost and can let students know that writing is truly a process, one that can be difficult. Students need to grind out their material. Teachers need to allow time for and encourage multiple revisions. If a teacher graded Rock on his first performances, he’d be rated a subpar comedian. Our students’ first attempts will be subpar and fall flat too. Students, like Rock, have to work hard and grind out their writing. Drafting takes time. We need to push students to revise. Rock throws things out, moves items around, changes words—the exact process that we need students to complete. Audience is key. Sims describes how closely Rock watches his audience. He listens for laughter, obviously, but he also notes when people smile, frown, cross their arms, or give any other sign that some of his writing isn’t perfect. Our students can emulate Rock’s focus by reading drafts aloud, accepting honest and constructive peer criticism, and looking at their pieces as performances that constantly need tweaking. If Rock reminds us that writing can be a grind, Seinfeld reminds us that this hard work can’t be short-lived. It must occur constantly and consistently—it must be ongoing. A famous story involves a young comedian running into Seinfeld and asking for career advice. Seinfeld told him to buy a wall calendar where all 12 months could be seen at once and to write jokes every single day. Every day that he wrote, he was to scrawl a red X over that date on the calendar. Seinfeld apparently uses this process as a visual reminder to write each day. It’s a way to hold himself accountable. Eventually the X’s create a chain and a writing streak is born. Once a writer has that chain, it becomes difficult to break the streak because a new habit has been formed. So what can Seinfeld teach students about writing? Visual reminders are powerful. It would be easy to just remind students to write every day. But unstructured goals get pushed aside. Things crop up, and “more important” activities often crowd out daily writing. Seeing a calendar that shows progress can be motivating. Students can keep their own calendar, or a teacher can create a classroom calendar. Write every class period. Set this as a goal for students. Copy Seinfeld’s process to see how many red X’s you can put on your classroom streak calendar to help create a writing habit in your class. If we can encourage students to follow Rock’s method of grinding out material and Seinfeld’s method of creating a writing streak, our kids will become much better writers.